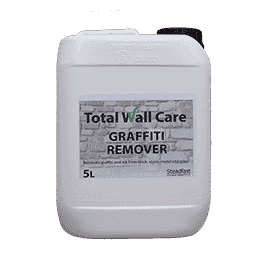 Total Wall Care Graffiti Remover is ideal for removing graffiti from delicate stone materials, brick, fine marble, natural stone, lead-polished stone, imitation stone, concrete, metal and glass. The product also removes glue left behind by adhesive tape. The product solubilises stains made by spray paint, in and marker pens without altering the surface of the stone or the underlying stone structure. In case of multiple coats of graffiti, old graffiti and paint deeply penetrated in the stone, as soon as the diluted paints strain, remove them with blotting paper and add new product on the remaining paints. Wash with water under pressure at the end of the application. The product also removes glue left behind by adhesive tape and cleans graffiti from glass and steel panels.